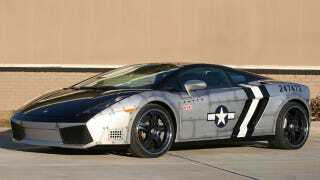 After stumbling across Chris Brown's Lamborghini Gallardo up done in a World War II fighter plane theme, a tipster pointed us to the man who came up with the idea and pulled off the detailed airbrush painting. Sean Burnley is a Georgia customizer who got the gig based on good relations with a customizing shop that had done work for rapper T-Pain, who had convinced Brown that his Lamborghini needed some sparkle. The original plan called for a camouflage pattern over the entire car, but Burnley had the inspiration to do a pattern based on a P-51 Mustang fighter instead. "Another artist Brad Keener created a great Photoshop rendering for me as a guide that was approved through Chris," Burnley told us. "I did a lot of research to be true to the plane in most details such the type of fasteners for construction and typical markings. I tried to inject some modern flavor as well by making most of the top solid black, creating a two-tone look. Also the interior was going to get bomber seats and airplane gauges but that got tossed out in favor of re-upholstery and a new stereo system." As for the numbers on the rear fender? They're not a true airplane code; dialed on a telephone keypad, they spell C-H-R-I-S-B. Burnley freely acknowledges the car provokes a love it or hate it response, and that the paint may have detracted far more value from the Lambo than it adds. Regardless of the critical response or the fighting history of its owner, Burnley's fighter theme proves that with an airbrush, he's an ace.